It's been a while since I used the kite die and matching sentiment set from Whimsy Stamps, so I decided to get it out and create a card with it. Since my last couple of cards were rather fall-ish, I decided to use some pinks and blues today. I created the circle background using dylusions inks and stencil. Then cut it out using a circle nestabilities shape, which I layered onto a black circle shape. Before adhering the circle onto my car base I spritzed some dylusions ink onto the card base and added the vellum striped paper strips. As mentioned above the stamp set is by Whimsy Stamps - Take Flight - which includes several fun kite sentiments, and I cut it out using the matching kites die set. The set includes two dies, a larger kite and a smaller kite. The one I used here is the larger one. If you are a scrapbooker, this stamp set and dies would be perfect to use on your summer scrapbook pages. Here is what the complete set includes. Love the splatter background Ellie and the whole colour palette is very pleasing on the eye. Cute, like the ink splatter :) Thanks for joining us at Penny's -see you Wednesday for a new challenge! Love the clean and simple look to your creation. Thanks for sharing on the Delightful Challenge of Don't Be Square. 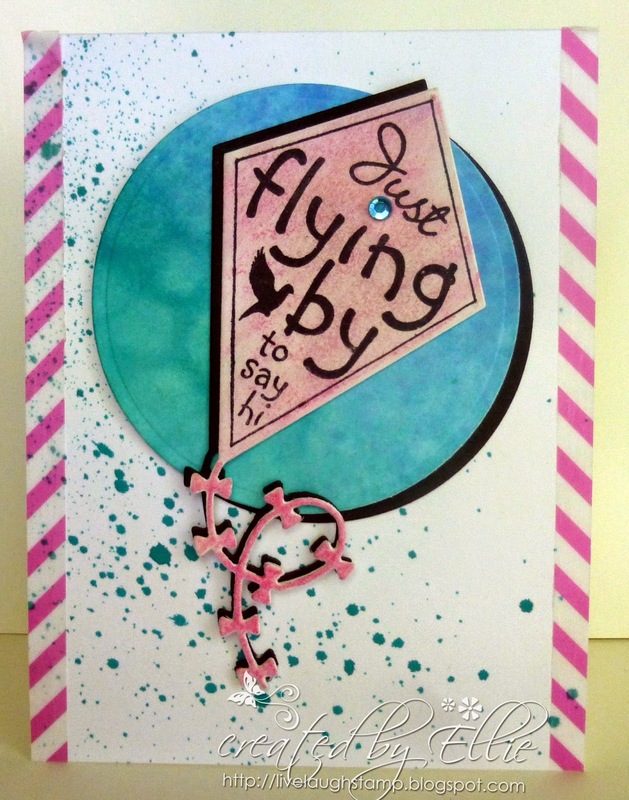 Fabulous card, I love that kite image and your beautiful spritzed background! Thanks so much for joining us at Creatalicious this month!